There are approximately 20,000 new diagnoses of prostate cancer every year in Australia and approximately 3000 deaths from the disease. A PSA blood test has been the main screening tool for prostate cancer detection for almost 30 years and studies have demonstrated that having a PSA test can save lives. More recently, magnetic resonance imaging (MRI) has been used to further improve detection and diagnosis. MRI scans allow urologists to be more accurate with localizing lesions within the prostate gland and facilitate a targeted approach when it comes to obtaining a tissue sample to confirm a diagnosis. For more information regarding prostate mri scans please have a look at our blogs from March and August 2014. Prostatic biopsies have traditionally been performed using transrectal ultrasound guided needle placement. This can be associated with a significant risk of infection and can make access of anteriorly placed lesions difficult. In more recent times there has been a trend towards performing these biopsies in a “transperineal” fashion. This avoids placing needles through the bowel wall and allows better access to the front part or anterior aspect of the prostate. At the Prostate Clinic, Gold Coast the transperineal approach has been the standard of care since 2011. Until recently “ cognitive fusion”, which relies on a surgeon’s ability to cognitively overlay real time ultrasound images with a previously obtained mp MRI, has been performed. Whilst this is a significant step forward, there are potential limitations with this approach particularly with larger sized prostates and smaller sized lesions or “targets”. To overcome this pitfall, there are different platforms now available that aim to remove the “guess work” with the fusion process and provide a more accurate, reliable, and reproducible platform to perform targeted prostatic biopsies. The Artemis/ProFuseplatform is one such platform and is the only system available that is based on a combination of 3D semi-robotic tracking and deformable MR-Ultrasound fusion. The Artemis platform uses a mechanical robotic arm to stabilize and hold the ultrasound probe (i.e. no freehand) and track it continuously in 3D. This eliminates the deformation of the prostate during the biopsy procedure and leads to accurate and reproducible biopsy targeting. In April 2016,Pindara Private Hospital trialed this system to help with improving prostate cancer diagnoses. 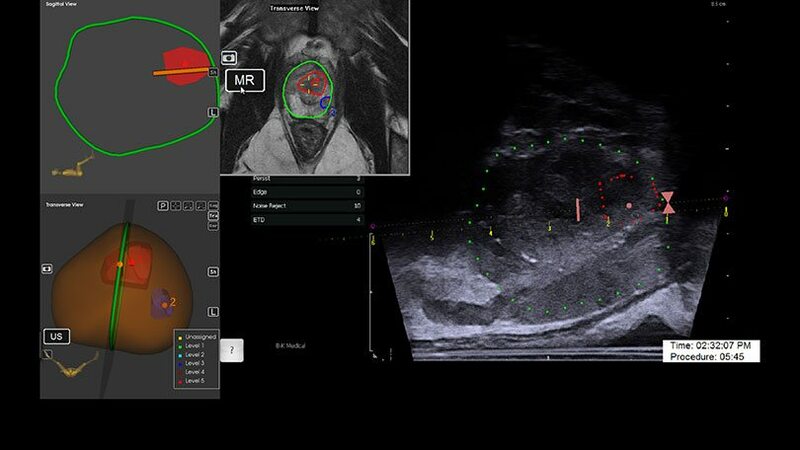 The device allows fusion or overlay of previously obtained MRI images with real time ultrasound images of the prostate. Prostate lesions are then mapped out in a 3 dimensional fashion whilst a mechanical robotic arm is used to stabilize and hold the ultrasound probe, which facilitates accurate, recordable and reproducible biopsy targeting. It should be noted that many prostate cancers do not require definitive treatment and can simply be “watched” over time. These tumours, which are still considered cancerous or malignant growths are very slow growing and are very unlikely to cause a man long term harm.Now having the ability to record the exact placement of a particular positive sample, taken using the Artemis, allows the treating urologist to go back to this exact same spot in the future to perform additional biopsies to confirm that there has been no change in a particular man’s cancer characteristics. This type of “treatment” is known as active surveillance. For those men with Pirad 4 or 5 lesions (ie those lesions on mri which appear suspicious for prostate cancer) the additional benefit is to perform fewer biopsies, again further reducing the side effects of the investigation whilst being more accurate in detection. In summary, the Artemis/ProFuse platform provides a unique, accurate and reproducible biopsy targeting and therapy planning platform which can allow more accurate and selective prostatic biopsies.